Sharpen your skates: It’s time to hit the ice in Ludington! 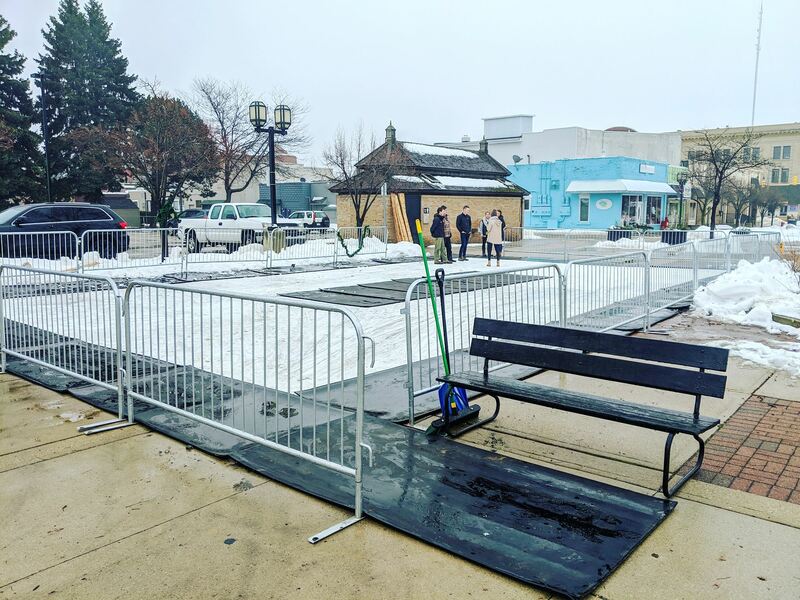 A new skating rink downtown has brought special excitement to the lakeshore, especially after it almost doubled in size last weekend. Located in the North James Street Plaza, the 30- by 56-foot, synthetic-surface skating rink was installed this winter. A spray-on product makes it especially slippery, and skaters can glide around it with ease. The rink is open to the public, free of charge, seven days a week. The $8,500 rink was purchased with donations from around 30 Ludington businesses, who supported the Downtown Development Authority’s vision to attract more people downtown. Outdoor enthusiasts who take to the ice must bring their own skates. The goal is to have skates donated to a local business, who would then be in charge of lending them; but that is not in place yet. The rink will hold over 20 adults. At this time, the area is meant merely for figure skating. Sticks and pucks must be left at home. Shovels and brooms will be on site, though, for skaters to clear the surface. To warm up, grab a hot chocolate or other cozy drink at any of the nearby businesses: Spindrift Cyclesports coffee bar, Red Rooster Coffee & Community or HumaniTea. If you need skates, check out the supply at Gordy’s Skate Co. Get in the spirit and enjoy skating and shopping in Downtown Ludington! If being indoors is more your style, the West Shore Community College Ice Arena has you covered. The regulation-sized sheet of ice is open weekly for figure skating, and the arena has numerous pairs of skates for rent. Staff will be on hand to sharpen your blades too, if needed. WSCC is open for public skating Monday through Friday, 11 AM-12:50 PM; Saturday, 1-2:50 PM; and Sunday, 1-2:50 PM. Admission is $5 and rentals are $2. There is also a family rate of $20 for up to five people, which includes skates. The ice arena boasts a full concession stand, complete pro shop and heated, spectator seating. For further information on skating lessons, freestyle skating, hockey teams or sticks-and-pucks sessions, check out the arena’s website here. Be sure to share your holiday skating photos with us using #PureLudington on Facebook and Instagram.